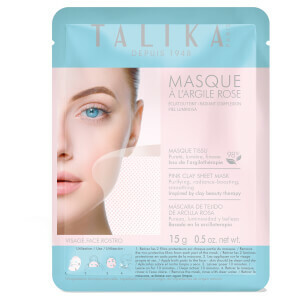 Reveal a radiant complexion with the Talika Pink Clay Mask, a deeply nourishing face mask that banishes dull skin. Infused with a blend of Red and White Clays, the mask helps to draw out any pore-clogging impurities whilst soothing and softening the skin for a visibly refreshed appearance. Separated into two parts for ease of application, the treatment does not dry out the skin or make it feel tight, and can be removed without rubbing. After just ten minutes, skin will feel calm and appear brighter, healthier and more youthful. 98% natural ingredients. Dermatologically tested. Single use. Usage: one to twice a week. 1. Remove the two protective films from each part of the mask. 2. Apply both parts to the face - skin should be clean and dry. Smooth out to fix in place.